Despite his having scored his first NFL tackle in Friday's game, it appears that No. 69, Brock Lesnar, will be cut from the Vikings. Is there no good in this world? This offer still stands and I am shocked no one has taken me up on it. 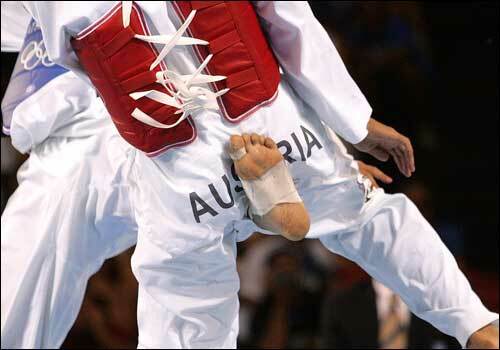 Here's one reason why I don't compete in Olympic Taekwondo. Well, that and my whole lack of athletic talent. The particularly arrect of you might have picked up on my love of all things British. Needless to say, then, much cheering and floor stomping occurred yesterday as a result of this and this. The relay win was fantastic. Admittedly, though, Maurice Greene probably would have closed the gap if the race had been a foot longer. I finally put an actual picture of me in my profile. I apologise to your eyes.